It seems like there is no stopping him - Martin Kabrhel has added yet another win to his already impressive list of feats. 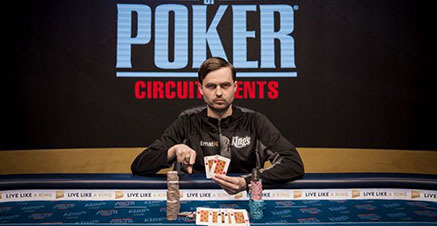 He won his 5th WSOP Circuit ring in the WSOP International Circuit Rozvadov Main Event – earning $213,349 and €10k entry into the WSOP Europe Main Event as reward for his performance. The Czech Republic’s number one all time money list player was playing at his home spot - his favourite Kings Casino in Rozvadov, owned by Leon Tsoukernik. Rozvadov is the the biggest cardroom outside of Las Vegas in the entire world. With 650 entries buy-ing in for €1,700 each, the total prize pool was just over €1.1million, and 23 players returned for the final day. Kabrhel was for sure the most experienced on the final table and you could see it by his performance during the last hours of the tournament. Last year’s WSOP Europe Super High Roller champion proceeded to destroy the opposition, and in the end he was responsible for 5 of the 6 eliminations before he was left heads-up against England’s Harry Ross. Short-stacked Ross would have to settle for 2nd place as Kabrhel finished him off quickly, but the €110,000 prize and WSOPE Main Event seat had him smiling, as was Kabrhel who added €190,000 ($213,349) and another gold ring to his solid resume.